Froggy's Fiber Followings: So we meet again... Everyday Yarn Challenge Sept 2009! So we meet again... Everyday Yarn Challenge Sept 2009! Last April I participated in the Yarn Everyday Challenge hosted by blondechicken on Ravelry. I found it to be really challenging and everyone's enthusiasm was contagious. While I wasn't quite able to make it to the end of the month, I really enjoyed seeing everyone's progress. Fast forward to mid-August and I felt the urge for another spinning challenge. I started with one goal but feel that is best to revise it to spinning everyday with a total of 15 finished yarns by month end. 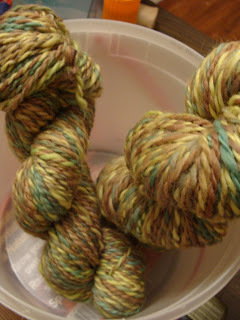 Here is my first and second day's worth of spinning.